Nengone Village Resort New Caledonia is an upmarket boutique hotel fronting a secluded white sandy beach on the south coast of Mare. With 18 traditional bungalows with stylish interiors perched on a small hill overlooking the ocean, a swimming pool and good restaurant, Nengone makes the perfect base for exploring the wonderful beaches and sights of Mare or simply enjoying solitude and an alluring turquoise swimming lagoon with good snorkelling off the beach. 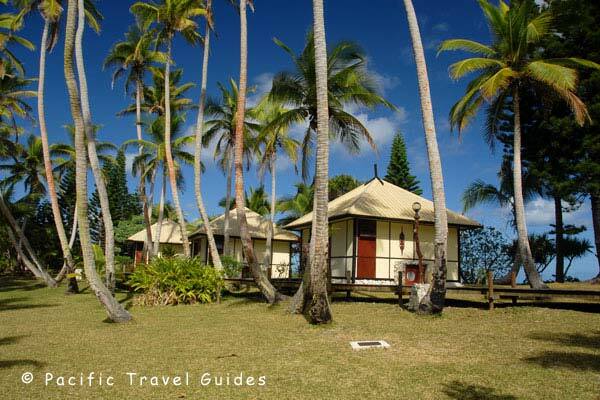 Accommodation is in open plan wooden bungalows either facing the ocean or set behind in plantation style gardens. Bungalows have high ceiling thatch roofs and a wooden veranda. Interiors feature a King size bed, single bed, writing desk with flat screen TV and tribal artwork. Bathrooms are small with shower and toilet and rooms have both air-conditioning and ceiling fans. Three Suite Bungalows are located at the far end of the property offering the best privacy, larger living space and in particular, larger bathrooms with bath tub. Interiors feature a King size bed, single bed, writing desk with flat screen TV and tribal artwork.